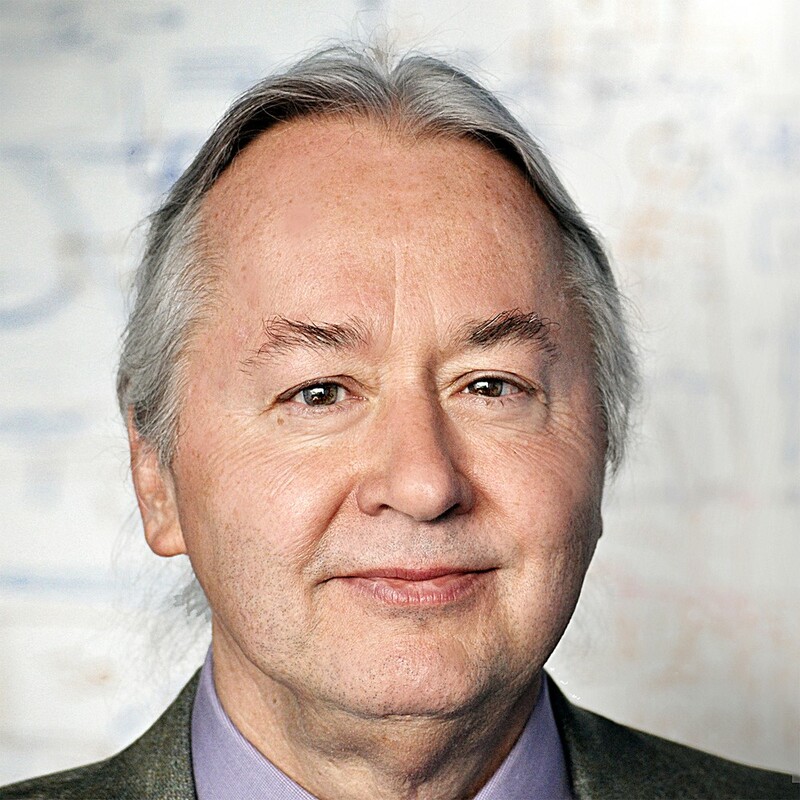 Stephen A. Marsh, 61, received $1.6 million in contributions on Indiegogo from more than 17,500 people to produce Airing, a tiny device that treats sleep apnea without the need for a large mask and hose. This all started with my brother, David. He’d been feeling terrible for a while. He was drowsy and irritable throughout the day. He’d get morning headaches and had trouble concentrating. And he would snore really, really, really loudly. All of which were classic signs of sleep apnea, a disorder where a person’s airway closes while they sleep. It’s a common, but miserable affliction. Try holding your breath for 30 seconds. You can always start breathing again, right? That’s not the case with sleep apnea: You randomly keep holding your breath throughout the night, without any conscious control over what’s happening and sometimes without the ability to start breathing again. It’s one of the main ways you die in your sleep. Maybe most famously, it contributed to the death of Reggie White, the Green Bay Packer and Philadelphia Eagle. David was diagnosed after undergoing a sleep study. The researchers taped a bunch of electrodes to his head, back and chest to understand exactly what was happening to him when he slept. They also strapped a plastic mask to his face, while a plastic hose stuck out from his nose like a long tentacle. He looked terrible and was horrified that he might have to spend the rest of his life wrapping this thing around his head in order to get a good night’s sleep. The doctors, of course, weren’t trying to be barbaric. It’s just that the plastic mask and hose David had to wear for the sleep study — a Ccontinuous positive airway pressure device, or CPAP — is the gold standard for treating sleep apnea. CPAP works by pushing air through a person’s throat, thereby preventing the throat from closing. In addition to being unsightly, it’s loud. The hose connects to a box that pumps air, and that box is far from silent as it works to keep someone breathing throughout the night. That’s probably why studies show that 50 percent of the 20 million people who have been diagnosed with sleep apnea stop using CPAP machines within the first three months and something like 80 percent of them stop using them within a year. When my brother sent me a picture of him in his mask, though, I thought I could help. At the time, I was working on a miniature fuel cell. Individually, they’re smaller than a human hair, but when put together in large enough numbers, they can power a smartphone, laptop or car. That obviously doesn’t have anything to do with sleep apnea. The fuel cells, however, possess metal plates that keep them from overheating by pushing air out like miniature bellows. I call them microblowers. That had everything to do with sleep apnea. “What if these blowers could pump air into David’s nose and keep his apnea at bay?” I wondered. After some quick math, I was convinced: Using the blowers, I could make a device small enough that David wouldn’t need the mask, the hose or the air pump. The other bit of inspiration came from my three little daughters. They had these silly plastic rings with plastic balls on the ends that made it look like they had nose rings. I figured the little balls could function as nosebuds, and I could put my battery-operated microblowers on the circular part of the ring, with a small grate across the front that would allow air through. I imagined something the size of an orange slice that could form a seal like the CPAP masks and pump the same amount of air. 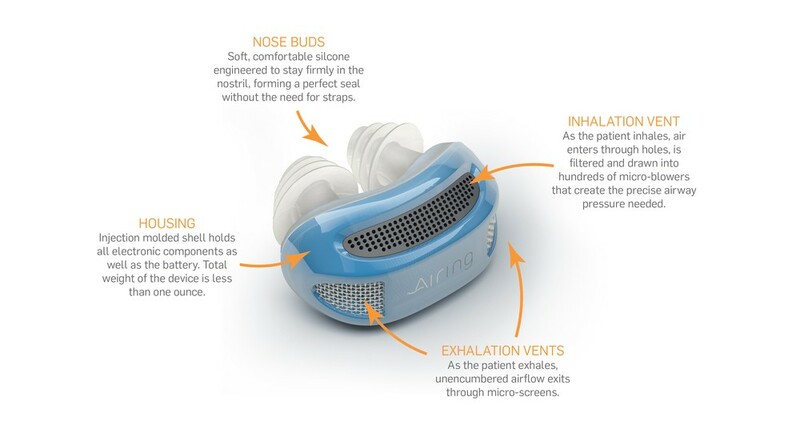 The Airing machine is designed to treat sleep apnea, though it is significantly smaller than a CPAP system. 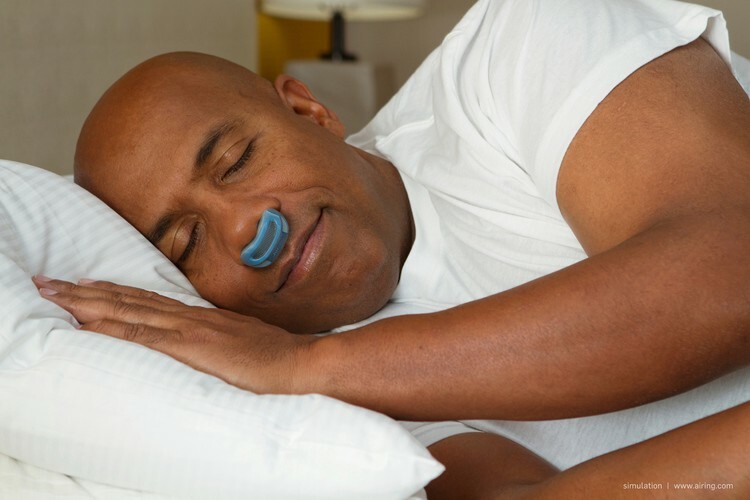 Several sleep doctors thought it would change everything about how we treated sleep apnea. And several VCs expressed interested in investing — at least at first. But after a considerable amount of time, we were still just talking money instead of actually getting Series A funding. I had become super frustrated by the process. One of our directors sensed this frustration and suggested we start a crowdfunding campaign. He said that while the campaign might not provide all of the funding we needed, it would allow us to control the process. That was significant for me. When you’re in control of your own destiny, it just feels better. From there, everything went fast. We launched a Facebook page at the beginning of April 2015. Next, we launched the Airing website. We had 8 million visitors in the first three months. Finally, on June 15, 2015, the Indiegogo fund-raising page went live. We had three to five people in a conference room watching the numbers. I made sure I brought coffee with me. It was going to be a long day. Around 10 a.m., the contributions started pouring in. It was like something out of a movie. Within the first hour, we had $10,000. I went to the bathroom and another $20,000 came in during the few minutes I was gone. At one point, it went up by $60,000 in a minute flat. We met our initial goal of $100,000 within a few hours. Needless to say, it was one of the most incredible days of my life. Most campaigns slow after the first month. But not ours. We’ve almost doubled the amount of money we made after those first 30 days — roughly $896,000. Today, more than a year later, we’ve raised $1.6 million from more than 17,500 individual contributors. Most of them have supported us because they either have sleep apnea or because they know or care about someone who has sleep apnea. I’m deeply humbled by the support. Everyday, I get an absurd amount of emails. People want this device, and they want it yesterday. Unfortunately, I can’t offer many specifics about how the money has been used to date. It’s too revealing and will give away some of our proprietary technology and methodology. You can’t innovate if other people, especially competitors, know what you’re doing and how you’re doing it. Suffice to say, I’m not personally a millionaire. What I can say is that money for projects like this typically pays for materials, engineering and the people to do the work. And that in our case, nearly all of it is going toward the creation of the nosebuds and microblowers and that we’re developing them as quickly as we can. We’ve gotten a fair amount of criticism for not working fast enough. That’s the thing about raising money via crowdfunding: We need to keep people updated on our progress. There are also more than 17,000 contributors I have to answer to — including my brother David, who was kind enough to contribute to the campaign as well. Obviously, the questions about speed couldn’t hit any closer to home. Even more so because David’s first question to me is always, “When can I get one to try?” He knows, though, that I won’t quit until he has one that’s fully capable of changing his life. It’s all I ever wanted in the first place.